This episode is a little different. It’s about a topic that I’ve previously written and spoken about, though not on the podcast. 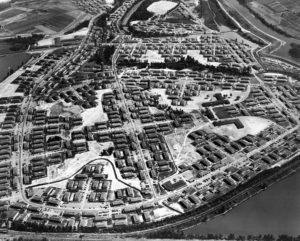 Vanport was one of the largest federal housing projects in the United States during WWII. It went up hastily and cheaply just outside of Portland, Oregon, producing supply ships in less than two months, and was Oregon’s first major African-American population center. In 1948, though, it was destroyed by a cataclysmic flood that wiped the then second-largest town in Oregon off the map entirely. Weird History Podcast is a 100% Listener-Supported podcast. Join our Patreon to get access to bonus content and other cool rewards, and help us tell more weird and out-of-the-way tales of history.